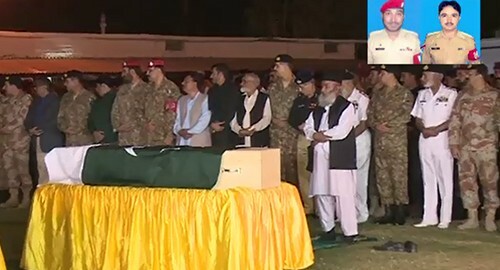 KARACHI (92 News) – Funeral prayers for two Military Police jawans was offered in Karachi on Tuesday. Corps Comnnander Karachi Lt-Gen Naveed Mukhtar, Naval Chief Admiral Zakaullah, DG Rangers Maj-Gen Bilal Akbar and others attended the funeral. Lance Naik Rasheed and Havaldar Arshad embraced martyrdom when terrorists opened fire on their vehicle on MA Jinnah Road. Four shells of a 9MM rifle were recovered from the site. Meanwhile, Prime Minister Nawaz Sharif has taken notice of the firing.